Derrick Rose about to make Mo Williams look worse than Orlando made him look in last year’s Eastern Conference Finals. I can still remember when developer Visual Concepts launched the NBA 2k series a decade ago on the Sega Dreamcast. It was a revelation. After years of titles failing to capture the essence of pro hoops, NBA 2k had delivered an unrivaled experience on the virtual hardwood. Fast forward 10 years and the latest release — NBA 2k10 — is no exception, as this series remains the standard bearer, adding enough visual polish and new features to keep would-be challengers at bay. As in past installments, NBA 2k10 once again puts a ton of basketball moves at your disposal, mapping the vast majority of them to the left stick. Combining the left and right triggers unleashes even more ankle breaking tactics, while manipulating the right stick in different directions will allow you to fire standard jumpers, floaters and runners. It’s a system that can be finicky at times and takes some getting used to, but in a sport like basketball that is fluid in real life it’s essential these things be ready accessible and not require hitting combinations of buttons. That doesn’t mean face buttons won’t be involved, however, as you’ll still be using them to do things like passing (A) and rebounding (Y). The game also offers the option to execute some of the left/right stick moves (like shooting) with these buttons, but you’ll be limiting yourself if you play that way. Play calling is once again activated by pressing the d-pad, allowing you to quickly call things like pick and rolls and post ups. That’s only the beginning this season, though, as you can now use the bumpers to cycle through position-specific plays. It’s nice that you’ve been given more options to call plays on the fly, but it can be a little time consuming and it necessitates you basically standing still with your player as you try to find the play you want to execute. The “Intense-D” feature feels a bit improved, although I still think that offensive players slip coverage too easily. It also seems the computer shoots an unrealistic percentage against my defense even when I’m practically in the CPU’s jersey. Despite these occasional frustrations, the overall control scheme is rock solid and even feels a bit tighter than last season. In a word, “Wow.” After churning out an excellent-looking release last year, I thought 2kSports had pushed things about as far about as it could. I was wrong. The graphics in NBA 2k10 are fantastic, highlighted by tremendous lighting effects and even more realistic looking movements from the players. On top of that, 2kSports has added a layer of polish that creates a broadcast experience with stat overlays, upcoming schedules and highlight packages. There are a few nitpicking details that could be improved upon, such as the occasional unnatural fluttering of the jerseys in close ups or the fact that sometimes the overlays will remain on screen even after the ball has been inbounded, obscuring the action. Overall, though, this is the best looking basketball game I’ve ever seen. The audio has also been ratcheted up this season with stronger commentary work by Kevin Harlan and Clark Kellogg, who generally follow along with the action and react with appropriate enthusiasm. One nice touch that helps each game feel more like part of an 82-game schedule is their referencing of recently played or upcoming games. If your team laid an egg in their last outing, expect to hear that mentioned during your next game. If one player went off for 40 points, expect to hear that too. Yes, the announcers will still make the occasional nonsensical comment, but it’s nothing more than a blip on the radar in what ranks as one of the top announcing efforts I’ve heard in a sports title. On the court, all the requisite squeaking sneakers and yells are present, while the soundtrack is surprisingly diverse and should appeal to more than just hip-hop fans. 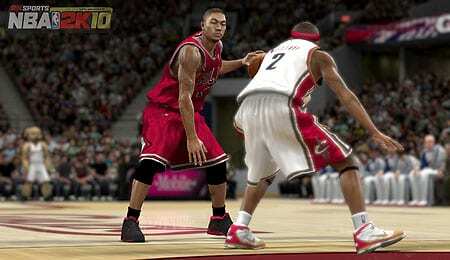 NBA 2k10 offers two deep single-player modes: The Association (franchise) and My Player. The latter serves as this year’s signature addition with My Player allowing you to create an NBA hopeful from scratch and then guide them through their career. Anyone who downloaded and completed NBA 2k10: Draft Combine will be able to import their creation and hop right into the draft. Those that skipped it will instead create their player from scratch and go from there. After joining a team you’ll play in the summer league with the hopes of being invited to training camp. It was after the summer league that I encountered a glitch, wherein I was told the team that drafted me (Phoenix) didn’t want me in camp and that I should choose a team to go to camp with. So I did, and then there I was in Suns’ camp anyways. However, many items (like depth charts) listed me with the other club. It’s primarily an annoyance and a patch is planned to correct it, but those without Xbox Live capabilities might want to scan the message boards for a workaround. Once in training camp you’ll need to play well to make the cut. If you do, you’ll likely find yourself glued to an NBA bench early on. You can also be sent down to the Developmental League, which is a cool addition and really helps highlight the importance of each possession since you’re breaking in as a fringe NBA player. After each game you’ll get feedback from the 2k Insider and earn skill points, which you’re free to allocate to any of the dozens of available attributes. You can also complete drills to improve, though none of them are particularly engaging and the dribbling drill borders on unplayable. The pre-game goal and in-game grading systems work identically to the draft combine (see our review of the game for details), and as such the same flaws are retained. I still feel the grading works well the majority of the time, but there are enough instances of faulty logic that some tweaks should be made before next year’s release. For instance, I was praised for grabbing an offensive rebound, but then dinged for being in “bad position” after kicking the ball back out despite being in the key for less than two seconds. However, easily my biggest pet peeve with the grading comes on defense, where you are docked whenever your man scores even if it’s in transition or you switched on a screen and are no longer defending him. Knowing this, I generally find myself following my man wherever he goes to the detriment of my team’s overall defense, which makes me play a less realistic brand of basketball. The other two knocks on My Player are some frame rate hitches that pop up once you’re playing in front of full NBA arenas and some shaky teammate A.I. in late-game situations. The frame rate issue can be a bit jarring the first couple times you see it, and it may cost you defensive position or a basket here or there, but it isn’t a huge deal. Downloading the game to your hard drive seemed to help, however it didn’t fix the issue completely. Teammate A.I. is a larger concern. Yes, when you’re down, the coach may choose to dust off the full court press, and intentional fouls will be committed late in games. Unfortunately, the A.I. appears to have no sense of urgency on the offensive end. In one game, I inbounded the ball to Steve Nash with 10 seconds left and the team down four points. Instead of hoisting a three, Nash simply held the ball for several seconds before passing to Grant Hill, who made a jumper with less than two seconds left. I lost. In theory you can tell your CPU buddies to shoot by pressing the X button, but I’ve found it unresponsive. Even with those issues, the My Player Mode is a welcome addition and should be a staple of the series for years to come. I love its individualistic nature because it asks you to play a complete game from filling the lane to boxing out or even setting screens for your teammates. With game, season and career goals that make you want to keep playing and improving your player, the replay value is off the charts. For those that prefer more control over their team’s performance both on and off the court, The Association has returned with some added features, including a new player progression system, the addition of the D-League and an improved handling of contracts. There’s nothing in that group that would be considered a game changer, but the NBA 2k series has always boasted a strong franchise mode, and NBA 2k10 falls in line. You’ll be able to micromanage to your heart’s content, assigning roles (from starter to bench warmer), situational subs and rotations down to the last minute. You can schedule practices to work on specific areas of your team’s game, ship guys down to the D-League or mastermind complex three-team trades. There’s simply a ton of options at your fingertips both as the GM and coach, and the revamped menu system seen in NBA 2k10: Draft Combine and NHL 2k10 makes accessing the information a much more user friendly experience than it’s been in the past. One new item I was excited to see added, but that didn’t quite work properly is restricted free agency, which is when a player can negotiate with other clubs but the team they played for previously retains the right to match any offer. During one offseason, I offered Joakim Noah a three-year deal at around $7 million with a player option for a fourth season. He weighed his offers and agreed to sign with me on the second-to-last day of free agency. However, the game informed me that Chicago had matched my offer, but in reality it hadn’t. Instead, the Bulls had been allowed to retain him with their one-year qualifying offer. It’s fairly minor, but I’d love to see it get straightened out. Beyond the two primary modes you’ll also be getting Living Rosters and the all-new NBA Today, which ensures you’ll have access to the most up-to-date rosters and ratings available. Being that it’s a feature that’s worth will be determined over the course of the season, I’m forced to reserve judgment, but the early returns from pre-season games are positive. Conceptually, the idea of daily updates that allow you to play any game with the most current information possible is a great one. Plus, the commentary and overlays will update as well to add to the experience. NBA 2k10 also dusts off NBA Blacktop, which is a street ball mode that allows you to play pickup games or compete in three-point shooting and dunk contests. The game also offers the option to create and experiment with various situations — such as down two with 10 seconds left and the ball. Single season and playoff modes are also available. Lastly, online play has received an overhaul. It’s much more accessible now, allowing you to play against actual opponents in basically any mode (that includes Association) with the push of a button. You can once again join online leagues as well as team up with other gamers to form crews with either real NBA teams or your created player to earn more skill points. Unfortunately, I’ve encountered issues with the crew pick-up games crashing almost immediately and more than a few instances of the 2k servers being down, though to be fair I do much of my gaming after 11 p.m. PST so they could just be down for maintenance. I do like the online options, now it’s simply a matter of tightening up server performance so they can be easily enjoyed. A handful of issues hold NBA 2k10 back from reaching its full potential, but it’s still the best option on the market and the addition of the My Player Mode helps elevate this to being the new measuring stick for basketball games. If you’re a hoops fan, this is a must buy.